Gillingham Football Club have abandoned plans for a new £60m stadium complex and admitted they will have to leave the Medway area to survive. The club had said Temple Marsh in Cuxton - near Gillingham - was the only site in the Medway area where they could build a 20,000 seater stadium. But chairman Paul Scally said the Gills would never follow Wimbledon's example by abandoning their roots completely. He said he was looking at four other sites in Kent for a new ground. 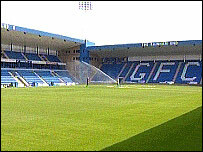 Mr Scally told the BBC last year he wanted to move the club to a new stadium, saying the current home at Priestfield, with its 11,400 capacity was no longer big enough. In April Gillingham outlined plans for a new stadium and a leisure complex featuring a casino and entertainment facilities. But Mr Scally revealed on Thursday the plans had been shelved due to the cost of improving transport links to the 54 acre site. But he confirmed the club's commitment to stay in Kent. He said: "We will never change the name and do a Milton Keynes Dons. "We will always remain in Kent, but there are no sites in Medway suitable for a sustainable arena. "Temple Marsh was the only one, and that has failed principally on the transport issue. "There is no alternative but to leave Medway, which we will do, with heavy hearts. "Irrespective of where our home ends up, and it will be in Kent because we are a Kent club, we will continue to work with the people of Medway. "It's not the council's fault they don't have the land but Gillingham has to develop and it's abundantly clear we have to leave the Priestfield Stadium to compete. "Frankly, it doesn't work here. Unless we build a sustainable arena and compete in the Coca-Cola Championship we will go backwards and end up in the Conference." 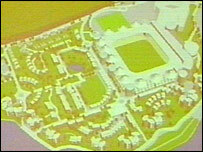 Mr Scally said the four sites in Kent being looked at included two in Gravesham, one in Swale and another in Maidstone. He said the club were in talks with each of the local councils and hoped to move within four years.